We’re back to our nefarious grave-robbing schemes, as we’re reviving Gem Slide once more for further scrutiny under the magnifying lens. Today, we will take a look at the second important design decision that I kept in mind as I developed the game. As this is a case study, you will most likely get a better idea of the principles presented here by trying out Gem Slide first by clicking this link. Design Principle 2: Make the Game Easy to Learn, but Hard to Master. The controls should be simple. Which one is easier to pick up: a platform game that only uses 2 buttons, e.g., for jumping and attacking, or one that has 6 different buttons, all reserved for different special abilities? I dare you to bet against the former. While there are games, such as certain simulator games, that require deep focus and learning just to get the basic controls down, the target audience of these niches is usually fairly small. When designing for larger audiences, simple controls are a must. This is exactly what most casual mobile games do, as they’re played by tapping, swiping or dragging on the screen. If you’re afraid that simple controls will limit you from creating intriguing and rich gameplay, then rest assured — it won’t be an issue. Simple controls don’t make a simple game. For example, Angry Birds is played by dragging back the band of a slingshot and letting go, and then tapping anywhere on the screen to activate the special ability of the flying bird. Doesn’t sound too difficult, right? However, behind the scenes, an intricate physics simulation is constantly running to calculate the motion and position of every single object, bird and pig on the level. What’s going on behind the scenes is actually complex, but it doesn’t seem that way to the player at all! All this allows for tons of interesting gameplay elements to be designed, and these building blocks can then be used to construct hundreds of levels. If the level designer ever runs into a roadblock, the controls certainly won’t be the limiting factor! Just like Angry Birds and another popular mobile game, Cut the Rope, Gem Slide uses the same, simple swipe mechanic, but keeps things interesting by mixing things up with a wide range of gameplay rules and varying level design. Lesson learned: take the complexity away from the controls and move it to other aspects of your game. The players should be given adequate visual instructions. Teaching the player to play your game is extremely crucial, and I can’t stress the importance of visual cues enough. When you’re designing tutorials, you should basically assume that your player is illiterate. Besides the people who can’t read English, I’ve heard of play test sessions where eye-tracking devices have been used to study at which parts of the screen the players are actually looking. Even if there was any kind of instruction text on the screen, just try to guess how many people never even glanced at it. The answer: way too many to brush these people off as a mere exception. Whether this phenomenon is caused by non-existent attention spans or by the fact that people simply find games confusing, it’s too common to simply ignore it. The solution to this apparent illiteracy is to use pictures and animations to support the textual information on the screen. As the old adage says, a picture tells more than a thousand words and animations tell more than ten thousand, provided the frame rate is sufficient. Assume that not a single tutorial instruction you write is going to be read, and try to find another way to get your message across. The written content should simply act to reinforce the visual information. In the tutorials of Gem Slide, instructional text is accompanied by a directional arrow and pointing hand that keeps repeating the same path from point A to B for as long as the player successfully completes the required movement. How much the player is supposed to slide a certain row or column is indicated by the length and direction of the arrow. If the players simply trace the path of the hand with their own fingers, they will perform the correct movement and be able to pass to the next phase of the tutorial. In addition, the squares of the grid that are not currently crucial to the tutorial are grayed out to make it easier to focus one’s attention on the current phase at hand. The tutorial hand and the arrow in level 1 demonstrate the correct swipe pattern. In addition, the players who actually bother reading text will gain additional information from the pop-up message. The first levels of the game should reinforce the learning progress. Besides teaching through images, let the player experiment a bit. Construct the levels so the players must use the skills they have been taught to complete the level. 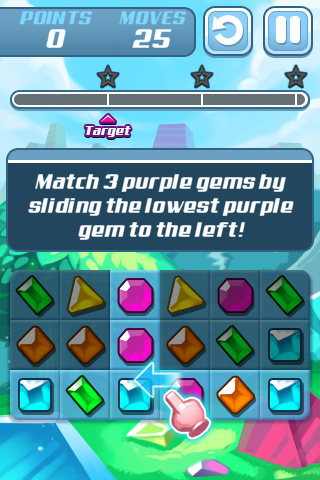 In Gem Slide, the very first level teaches how gems can be slid both horizontally and vertically to make matches. To complete the level, the players are required to complete a few matches on their own after the initial instructions, which means they will be forced to perform more basic swipes. In addition, the player is given an ample number of moves to freely conduct his own experiments without being punished. 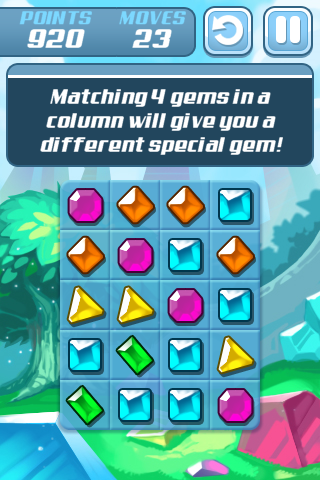 The second level is constructed in such way that after you make the first match of 4 and activate the special gem produced by it, you are provided enough gems to form more matches of 4 in just 1 or 2 moves. And, there’s not just one opportunity offered, but multiple ones! Setting up the board like this was possible due to the deterministic system I talked about in the previous post of this series, as I was able to know how the board would look after the moves instructed by the tutorial had been played. The situation after the obligatory tutorial moves have been played. Here, it is possible to form a quick match of 4 by either assembling the blue gems vertically or the orange gems horizontally. Level 3, on the other hand, can’t be cleared unless you do at least one ‘intermediary’ move at least once after the instructions that teach it. By ‘intermediary’ move, I mean moves that won’t result in a direct match, but get you one move closer to making one. Again, I was able to guarantee this because of the deterministic system. I also like to think that skillfully crafted games consist of “two layers.” The first layer consists of what’s clearly visible to all players. Anyone who plays the game will see and experience this layer, at the very least. For example, every skill taught in the tutorials is a part of this layer, as they are clearly visible to anyone, beginners and more experienced players alike. For the advanced players, there is a second layer, which is actually somewhat hidden. The presence of this layer is not communicated to the players directly at all. Rather, it’s up to them to discover it by being creative, experimenting or inferring. This layer includes techniques, gimmicks and shortcuts required to reach the highest possible scores and ratings of the games. The beauty of this ideology is that it offers something different for everyone by using the exact same content: the beginning players can enjoy the game without ever figuring out the advanced tricks their more experienced counterparts are taking advantage of. They will be able to complete all the levels, but it’s unlikely they would achieve 3-star ratings in the latter levels, as these often require the player to partially unveil the hidden layer. Let’s take a look at a small example. Note that this reveals the trick for level 20 of Gem Slide, so if you want to play and figure it out yourself, I suggest you skip the next paragraph and the the following video altogether. Many players first figure out the standard way to clear level 20, which is to build a normal and a boosted row remover, one of each. If placed correctly, these will be enough to clear the 4 target squares, clear the level and earn 1 or 2 stars. 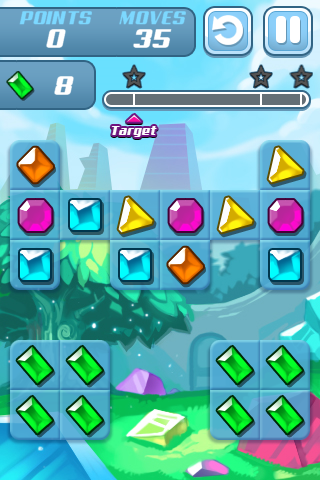 However, to earn all 3, the players are expected to notice the level can, in fact, be cleared by building only a single normal row remover; if the rightmost column is moved upward one notch and the remover is launched at the same row as the orange gem between the green gems, the 4 green gems will be matched on top of the target squares, removing them. This strategy requires a lot less moves than the previously mentioned one, and guarantees a 3-star-rating if executed properly. Besides the above, advanced players will generally also develop their ability to notice which match should be built at a given time. Even though matches of 5 and cross-matches give the highest points and the most powerful specials, they are not always the best choice, as they’re time-consuming to build. Instead, the best strategy is often to look for matches you could complete in just 1-2 moves. In addition to the score given by each match type, an advanced player will also notice which special gem would be the most suitable for a given situation. To clear all levels of the game, every player has to learn to build normal and boosted special gems, but learning more deeply about their use is not a requirement. An example can be seen in level 30. Again, the spoiler alert applies — feel free to skip this paragraph if you don’t want the 3-star solution for level 30. The level in question is generally approached by building matches of 4 to gain a column remover. These, however, are not the quickest way to clear the level, and thus, using a strategy revolved around them is not likely to result in a high score. The key lies in building a boosted color-remover gem, which removes all gems on the board when activated. These can be formed by a match of 5, but there’s a catch; they’re tricky to build because of the limited space given in the level! Therefore, advanced players attempting good scores will be forced to come up with the proper technique for building these on a grid of a specific shape. Level 30 starting position. The general shape makes the level interesting and adds difficulty to creating big matches. And that wraps up design principle number 2! Stay tuned for the post discussing the last one, which will be published in the near future! Until then, take care!